Amb. Vitaly Churkin (front, right), of the Russian Federation vetoes a draft resolution on Syria. China also vetoed the resolution. Secretary-General Ban Ki-moon voiced deep regret after Security Council members were today unable to agree on a resolution backing an Arab League plan to resolve the crisis in Syria, where thousands of people have been killed over the past year since authorities crackdown on a pro-democracy uprising. Thirteen of the Council's 15 members voted in favour of a draft text submitted by Morocco, but China and Russia exercised their vetoes. A veto by any one of the Council's five permanent members means a resolution cannot be adopted. "This is a great disappointment to the people of Syria and the Middle East, and to all supporters of democracy and human rights," he said in a statement issued by his spokesperson. "It undermines the role of the United Nations and the international community in this period when the Syrian authorities must hear a unified voice calling for an immediate end to its violence against the Syrian people." Mr. Ban said that in the wake of today's vote, it has "become even more urgent" for the international community to redouble its efforts to seek a Syrian-led political transition to a democratic, plural political system." He pledged the UN's willingness to step up efforts to "find a peaceful and durable solution which will bring the violence and the killing in Syria to a halt." General Assembly President Nassir Abdulaziz Al-Nasser later added his voice to the concern, in a statement issued by his spokesperson. "The longer the Security Council remains divided in adopting a consensus position on developments in Syria, the more difficult the situation becomes, with more Syrians being killed daily," the statement said. Mr. Al-Nasser urged the Arab League to continue its efforts to find a solution and called on President Bashar al-Assad to "listen to the voices and aspirations of his people." The draft resolution backed an Arab League plan of 22 January to try to resolve the crisis in Syria, which began in March last year after widespread public protests began in the Middle East country. UN human rights officials have said more than 5,000 people have been killed. The protests were part of the broader Arab Spring movement that engulfed the Middle East and North Africa and led to the toppling of long-standing regimes in Tunisia, Egypt, Libya and Yemen. The Arab League plan, as outlined in the draft, called for "a Syrian-led political transition to a democratic, plural political system, in which citizens are equal regardless of their affiliations or ethnicities or beliefs, including through commencing a serious political dialogue between the Syrian Government and the whole spectrum of the Syrian opposition under the League of Arab States' auspices, in accordance with the timetable set out by the League of Arab States." The resolution also called on the Syrian Government to cease violence against civilians, withdraw its armed forces from cities and towns and return them to their barracks, guarantee the freedom of peaceful demonstrations and allow unhindered access for all Arab League institutions to "determine the truth about the situation on the ground and monitor the incidents taking place." The text condemned "all violence, irrespective of where it comes from, and in this regard demands that all parties in Syria, including armed groups, immediately stop all violence or reprisals, including attacks against State institutions." Speaking after the vote, Russia's Ambassador Vitaly Churkin said the text as it stood "sent an unbalanced signal to the Syrian parties," with no call on the Syrian opposition to distance itself from extremist groups. He said a solution to the Syrian crisis must be "objective" and said some Council members had actively undermined opportunities for a settlement and pressed for "regime change." Mr. Churkin said Russia was actively involved in diplomatic efforts to resolve the crisis and, to that end, the country's Foreign Minister Sergey Lavrov would lead a delegation to the Syrian capital, Damascus, on Tuesday for talks with Mr. al-Assad. China's Ambassador Li Baodong voiced disappointment that the draft resolution did not incorporate amendments proposed by Russia, which China supported. He said an "undue emphasis" on pressuring Syria's authorities would prejudice the result of dialogue and only complicate the issue rather than ending the fighting. He said the sovereignty, independence and territorial integrity of Syria must be fully respected. Also speaking after the vote, French Ambassador Gerard Araud said it was sad that a "double veto" had been exercised. "It's a sad day for the Council, it's a sad day for Syrians and it's a sad day" for supporters of democracy, he said. Mr. Araud said it was particularly disappointing given reports that Syrian forces had killed a large number of civilians in the city of Homs in the past 24 hours. Susan Rice, United States Ambassador, said she was "disgusted that a couple of Council members" had prevented the body from taking action to protect Syrians. She said those members had held the Council hostage on this issue for months, hiding behind "hollow arguments" and putting forward "wrecking amendments" to draft resolutions. 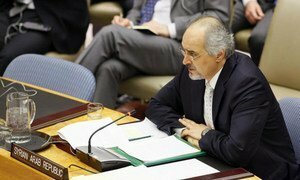 Syria's Ambassador Bashar Ja'afari said Syria would have been able to fulfil the Arab League plan if Western countries and others had not given "billions of dollars" to armed opposition groups and hosted them "in their capitals" to facilitate attacks against Syrian civilians. He said Western power was often used at the expense of peoples of developing nations, and added it was noteworthy that the Council had adopted about 690 resolutions between 1945 and 1988, and yet about three times that number in the two decades afterward, indicating that the world is less secure, less just and less fair. The Security Council this afternoon began debate on the situation in Syria, where thousands of people have been killed over the past 10 months in a Government crackdown against a popular uprising.